By Amine SAHRANE – Writer for L’Economiste in Morocco (article published Nov 20, 2017 and translated from French to English). “The Great Depression helped awaken my social conscience. During that time, I found that the land was the same, the resources were intact, but people had no money to buy the products. At that moment, I felt that our rules were obsolete and inefficient.” Jacque Fresco was born in March 1916 in Brooklyn and died in 2017 at the age of 101. He experienced the crisis of 1929, the Second World War, the rise and fall of communism … all of modern history. He is an engineer, economist and philosopher who didn’t go to school. He was not interested in the school system which he left at an early age. This American preferred going diligently to the library. He was also doing experimental work at home. At the age of 13, the prodigy designed a rubber fan after a family member was injured by a metal fan. "My design did not interest the companies but soon after, the product was marketed. This is how I was introduced to the free market,” he says in an interview. Fresco worked as an engineer for several companies as well as for the American army, for which he conceived airplanes. Many of his inventions are widely marketed. For example, he designed systems to reduce noise and pollution of planes, experimental equipment for behavioral science, prefabricated industrial buildings … In 1956, he predicted that there would be unmanned cars with sensors to reduce the risk of collision, the Google car. His greatest achievement however is the Resource Based Economy. This system is the result of 75 years of research and reflection. The Resource Based Economy is “a socio-economic system that uses today’s science and technology to produce abundance for all, without money, barter, debt, credit or servitude.” We are not talking about an economy that just supports basic needs but a highly advanced, prosperous society that ensures that every individual has a very high standard of living. The reasoning of Fresco stems from the belief that violence, poverty, jealousy, greed, etc. are behaviours generated by scarcity. "Imagine that it starts to rain gold. People would stampede out to get it on the first day, they would not pay much attention to it the next day and by the third day, they would begin to sweep the gold out the door, even throwing away the ring on their finger,” he explains. The philosopher therefore rejects the notion of "human nature." We are not born with greed, hatred, bigotry … our behaviors only reflect our environment. Changing the behavior requires changing the environment. Fresco makes a second observation: for the first time in history, we have the possibility of ending scarcity provided we use the technology. He realizes that science is developing at a very high speed, but that social systems are stagnating. The scientist therefore develops a mode of organization that is based on the resources available and not on money. Hello, my name is Manoha, i’m an student from Spain, i’m in the last year of technical architecture, now i’m searching a job, i would like to collaborate in any way on this proyect. My economic sitaution is unstable, my level of english is medium-low but with interest and you want, the language doesn’t have to be a problem. I would like to speak directly with Jacque Fresco by e-mail, meet him and hear his opinion and advice on this matter. Well, i hope everything goes well. A cordial greeting, sincerely Manoha. He died this 2017 unfortunately. Why do you want to collaborate on this project, if you don’t mind me asking? And what do you think you would be able to bring to this project? It is/was good to read unbiased and non-political but realistic attempt to a motivate for a better world. RIP Mr Fresco, thank for all your work and all my respect. There are and still and will be Ghandis in this world who are striving to steer the ship away into better waters. Heart bleeds at his departure. Its a sad thing that the man whose ideas could literally change the world and save our planet died and there was no fan fair, nothing, no major new items. he was never celebrated in anyway. he didn’t get a Nobel Prize, he wasn’t recognized by the main street. And I know the reason why. this little old man’s idea could stop their gravy train, and make the world a better pace. Sad huh.. Sad little beings with sad sad lives going at nothing. Glass raised to the little old man. Its our duty to continue with hi legacy. This is the first I have heard of Jaques passing. He helped free my mind. На год опоздал, чтоб сказать слова благодарности Жаку Фреско за его работу. Благодаря ему пересмотрел взгляды на жизнь. Спасибо ему за такой великий труд. Начала слушать его только месяц назат. Но уже безумно благодарна ему. Жаль что его не стало. It was not until today that I became aware that Jacque Fresco has passed away. I still regret not attending the event in Copenhagen years ago when the Zeitgeist movement was at it’s peak. 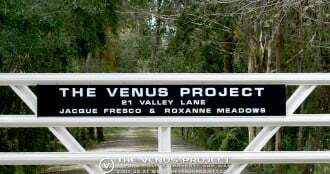 It was through the Zeitgeist movies that I was made aware of the Venus Project. I really would have wanted to at least attend an event with Mr Fresco, I’m not sure about what I would have asked him, I’m an introvert person, but I do love listening to and reading the works of greate individuals as him. Persons like Fresco are few and far between. Unfortunately great minds do seldom get do witness the realization of their life’s work. At least Jacque was able to live by example at a small scale facility. Personally, I have searched for years for something meaningful to strive for. The Venus Project has been in the back of my head through many years and I have regreted that I do not hold a degree in architecture or similar. I do read a lot of books in a range of subjects and mostly in English, simply because there is more written in that language (I’m from southern Sweden). I took my PhD too early and I wish that I had started working before to know more what I wanted to “be”. Today I work 30 hours a week in a warehouse. I’m glad that I have spare time to read (no, I haven’t attended any course since my PhD), but I wish I had a direction, something to strive for. Money and power have never been motivating factors for me, I’m not well adjusted to the society I live in and I have never felt like I was. I did the English test that was a prerequisite for a course I found here, I got C2 in both the tests. Perhaps I could be if some use to the project, I don’t have any experience from work life, which I suppose is one reson for not having moved on in my working life. I would like to get better at comminicating face to face, I like to write and feel way more comfortable communicating in text. It is very sad indeed that most people today at best “like” or share visions like The Venus Project. But there are a lot if people volonteering for an array of different causes in the current system, so I guess that there is hope. Unfortunately I assume that architects and similar professionals in general do not have many hourse to spare for volontary work. But then again, if they are wholly convinced that The Venus Project is the future, they will create that time. Thank you for all your work Jaqcue Fresco. Thank you for trying to wake the people if the world and for your great efforts to transform it to a better place, for everyone. Thank you for dreaming huge and for leaving us the blueprints to a more “perfect” future. You will be in our hearts and minds, always. Our time here is fleeting, what matters is what we leave behind for others to expand upon, should they choose to. I am a Chinese, after knowing about Mr Fresco’ lectures and documentaries,I realize Venus project is a kind of new social form of the blueprint, China although lagging behind the western countries, with the expansion of world trade and the introduction of other countries’technology. our GDP is developing quickly, but the result is also serious like the environmental problem ,social anxiety, consumerism, materialism problem and the big gap between the rich and poor. I am just an ordinary college students, also will face the employment problem,The policy that different governments have proposed verbally may not be available at the grassroots level, especially in China, a large developing country with uneven distribution of resources. I’m sorry to hear about your passing at the end, but I think what you are saying is not a utopia, but a best way to make better use of existing resources.The obstacles may come from the invisible hand of the capital markets, but the most of us will stand on our ground .